Dermal fillers are hyaluronic substances naturally found in the body which have a hydrating property and give volume, shape and hydration to the skin. 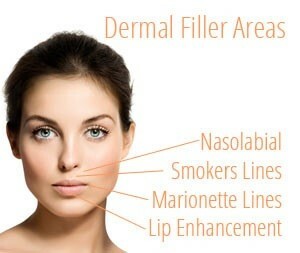 Dermal Filler treatments improve your appearance by smoothing out fine lines, wrinkles and folds, reducing their appearance giving you a more youthful look! They are mostly used in the lower face for deep folds between the nose and mouth, lines in the corners of the mouth, and to create fuller lips. The results are visible straight away and give a natural look. Using very fine needles allows the procedure to be virtually pain free. Side effects are extremely rare but can include slight swelling, discomfort and occasionally minor bruising. The effects last between 4 and 9 months depending on the treatment areas. You can return to work immediately afterwards.